In America, a female sweatshop worker from a Polish shtetl could become a renowned writer and Hollywood commodity. For many of the Jewish immigrants who came to the United States in the late 19th and early 20th centuries, the experience of life in a new country was often one of grinding poverty, social exclusion, and the desperate struggle to survive. America was a land of new beginnings, but those beginnings offered no guarantee of a satisfactory conclusion. Anzia Yezierska was one of the millions to leave Eastern Europe in search of a better life, departing Poland at the age of 15 along with her family and coming to New York in 1898. Yezierska’s family settled on Manhattan’s Lower East Side, where her still-pious father resumed his daily Torah study, and her mother worked to earn money for the family. While her brothers were encouraged in their educations, Anzia was sent to work in a series of sweatshops. Yezierska eventually wangled her way into an undergraduate program at Columbia University without a high-school diploma, pursuing her education against the express wishes of her family. At school, she studied literature and philosophy, and went on to work as a teacher for a number of years. After a brief, failed marriage, Yezierska met the noted scholar John Dewey, with whom she was romantically involved for a number of years, and his encouragement pushed her to try her hand as a writer. Hungry Hearts brought Yezierska surprising acclaim, along with an opportunity to work in Hollywood. Samuel Goldwyn bought the film rights to Hungry Hearts, eventually turning it into a well-received movie. Yezierska was briefly hired as a screenwriter, and offered a $100,000 contract by Goldwyn before leaving California and returning to fiction. Her first novel, Salome of the Tenements (1923), took another stab at Yezierska’s favored theme of doomed love between a working-class girl and her well-heeled suitor. It, too, was adapted into a film. Sara is desperate for those very things in limited supply on the Lower East Side: quiet, cleanliness, and privacy. 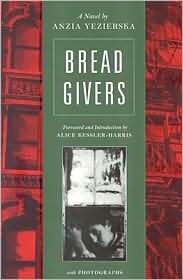 Bread Givers is a furious blast directed at all those who sought to keep Yezierska silent—not just her family, but the world of immigrant Jews, and America at large. Sara’s burden is not just that of the immigrant, but that of the Jewish woman, doomed to frustration by the second-class status imposed by religion. The book is ultimately a showdown between two fanatically stubborn individuals, and part of the lingering bittersweetness of Bread Givers is that even in winning, Sara never truly triumphs over her father. Yezierska went on writing after Bread Givers, but to a diminishing audience. After All I Could Never Be, in 1932, Yezierska would not publish another book until her autobiography, Red Ribbon on a White Horse, in 1950. Her work largely overlooked by a later generation of readers, seminal books like Bread Givers and Hungry Hearts would be rediscovered by American letters in the 1960s, primed by the re-emergence of Henry Roth’s thematically similar Lower East Side novel Call It Sleep and Yezierska’s pre-feminist consciousness of women’s struggles. In finding her work once again, readers have been able to glimpse the remains of a lost world, carefully and lovingly preserved by a writer who both experienced it, and escaped it. This Nobel-winning Holocaust survivor brought the Holocaust and its survival to the American public.